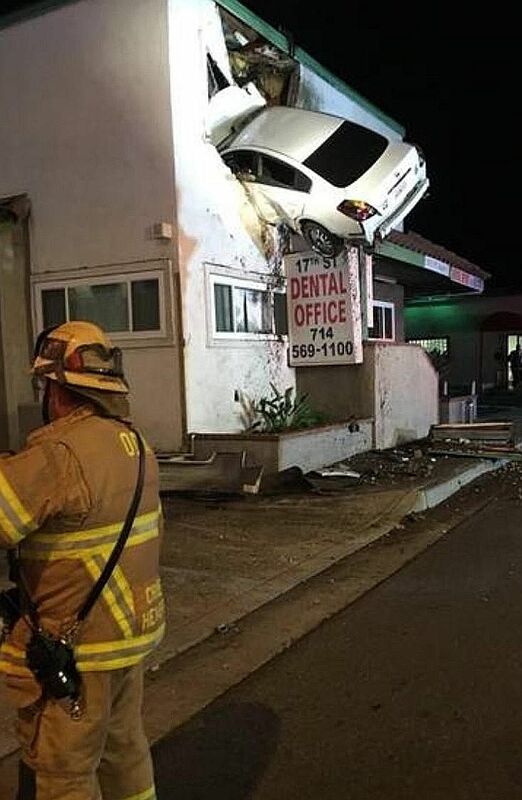 LOS ANGELES • A Nissan sedan became airborne and crashed into a California dental office, coming to rest dangling out of the building's second storey, the authorities said. The police in Santa Ana, California, said the car clipped a median outside the building and flew about 20m before slamming into the 17th Street Dental Office on Sunday. The crash, which happened at about 5.25am, rattled guests in a motel next door, but the dental practice was closed at the time. The Los Angeles County Fire Department used a specialised forklift and wrecker to remove the car, the police said. One of the two people inside the vehicle was able to exit on his own, but emergency workers had to remove the other person, a police spokesman said. The driver told officers he had used drugs before the crash, and was taken to a hospital for treatment of minor injuries, the police said. The spokesman said the authorities had filed a charge of driving under the influence, but the driver had not yet been arraigned because he was in the hospital. On Sunday afternoon, the car was gone from the building but a giant hole remained on the second floor of the dental office. The owner of the practice could not be reached for comment. A woman who works at the motel next door said it was fortunate the motel was unscathed. "Inside, it's a major loss," the woman, who declined to provide her name, said.